Never has a hurricane been more aptly, if tragically, named than Sandy, the superstorm that flooded New York City and battered much of the East Coast…. As I write this early on Tuesday morning, watching this game-changer of a storm, a myriad of thoughts go through my head. The storm event is just the beginning. Rivers will flood, and snows will accumulate. Recovery will be long and slow. Recovery will be hampered by problems with energy delivery, complexity, and density of populations. Just in time, digitized systems that are overly complex will be challenged. News will filter out slowly, with initial optimism about the extent of the damage, followed by increasingly pessimistic reports about the size and extent of the problems as communication begins to be reestablished. 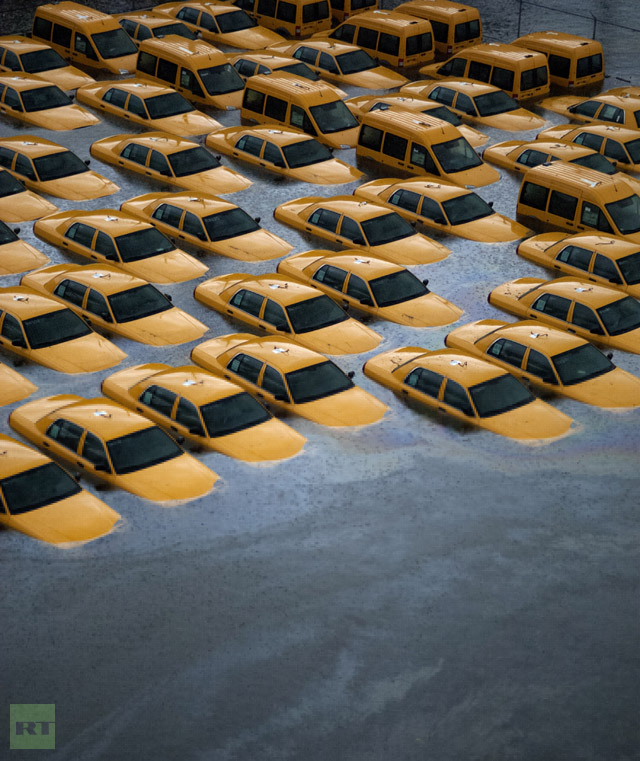 This post describes Sandy as a catastrophic pulse in relation to the problems of dense urban living, complexity, and digitization. The missing ingredient in nearly all the talk was an explanation of what a hurricane, even a small one, was doing in the North Atlantic at the end of October. The answer of course is global warming which even though it has raised average ocean temperatures by only 1o F. has extended the hurricane season enough to produce this calamity. We should give CNN some credit for the day after the storm they called an array of climate scientists to find out what happened. All of the scientists pointed a finger directly at global warming and noted that the problem was only going to get worse and worse as the sea level was rising and the arctic melting much faster than had been predicted five years ago. For years climate scientists have warned us that seemingly minor changes in global temperatures would lead to unusual weather events having serious consequences. They clearly got it right, for in the past decade we have had several major hurricanes that tore up Gulf oil production and nearly did in New Orleans and several other Gulf towns; outbreaks of tornados that flattened towns in the mid-west; floods in the Mississippi valley; droughts in Texas and the corn belt; blizzards on the east coast; and two monster storms in a row slamming into the New York area. We live in a world dependent on electricity and we forget that being dependent on something — however wonderful that thing is — makes you vulnerable. Even getting a back-up generator isn’t a painless solution for household resilience. A medium-size generator can cost $50 or more per day in fuel to run. And just hope that your local gas stations don’t lose power or sell out to panic buyers before you get there. In the long run, generators are dependent on fossil fuel inputs and fossil fuels are finite resources that are getting scarcer and more costly. That’s why it’s a good idea to hedge your bets on the future with some low-tech options to keep your lifestyle gracious and enjoyable in disasters both natural and man-made. So, in light of Frankenstorm Hurricane Sandy, I thought I’d share a few prep tips for your consideration. If it’s too late for you for this storm, get them in place for the next one, and for a future that’s sure to be more vulnerable to electrical disruptions and fuel scarcity as these kinds of storms become more frequent and the cost of fossil fuels rises as they deplete. You can donate to the Red Cross’s hurricane relief efforts here. I can’t get over it. What a wacky thing for Mittens to say! I had to join the crowd obsessed by this crazy meme, and create a new blog…a place to discuss the presidential race. …comes from Film/TV/Pop Culture critic Bob Mondello, delivered in 4 minutes and 23 seconds on NPR’s All Things Considered, Oct. 12, 2012. Mondello likens the debates, and the reactions from media and public to ‘American Idol’. No wonder we react in a big way after a televised debate, declaring winners and losers, swinging polls three or four points. We’ve been conditioned. But the things reality shows have conditioned us to look for – polish, brashness, engagement with the camera – are all surface, not things that have much to do with governing. When the chatter the day after a debate is about performance – did the president look down too much? Was the congressman smiling or smirking? We’ve left serious political discourse and entered White House Idol territory. Talent shows, like beauty contests, are all about style. There’s another dimension to debates: content, the one thing we’re never asked to judge on most reality shows. Being able to belt your big finish to the rafters is what matters on “American Idol.” The quality of the lyrics? Not so much. Last night I had the privilege of introducing author Andrew Nikiforuk to the “Literature Live” audience assembled at Village Books in Bellingham, WA. His latest book is The Energy of Slaves: Oil and the New Servitude. It was a great talk, and a good discussion (I hope to get a recording of the talk online soon). A new post today by Michael Klare expands on this same motif. This is a great post summarizing the reality of today’s situation, in contrast to a number of articles appearing in the mainstream media over the past year claiming that we need not worry about peak oil, and that energy independence might return someday soon to the U.S. Klare is the author of numerous books, the latest of which is The Race for What’s Left: The Global Scramble for the World’s Last Resources. His new post at Tom Dispatch is titled “The new ‘Golden Age of Oil’ That Wasn’t”. By employing impressive new technologies — notably deepwater drilling and hydraulic fracturing (or hydro-fracking) — energy companies were said to be on the verge of unlocking vast new stores of oil in Alaska, the Gulf of Mexico, and shale formations across the United States. “A ‘Great Revival’ in U.S. oil production is taking shape — a major break from the near 40-year trend of falling output,” James Burkhard of IHS Cambridge Energy Research Associates (CERA) told the Senate Committee on Energy and Natural Resources in January 2012. It turns out, however, that the future may prove far more recalcitrant than these prophets of an American energy cornucopia imagine. To reach their ambitious targets, energy firms will have to overcome severe geological and environmental barriers — and recent developments suggest that they are going to have a tough time doing so. Consider this: while many analysts and pundits joined in the premature celebration of the new “golden age,” few emphasized that it would rest almost entirely on the exploitation of “unconventional” petroleum resources — shale oil, oil shale, Arctic oil, deep offshore oil, and tar sands (bitumen). As for conventional oil (petroleum substances that emerge from the ground in liquid form and can be extracted using familiar, standardized technology), no one doubts that it will continue its historic decline in North America.